Today is the start of a series of posts on caries interpretation which can be challenging at times. Today is interproximal caries. Here’s the goods. Most commonly found at the level of the contact point or slightly apical to it. 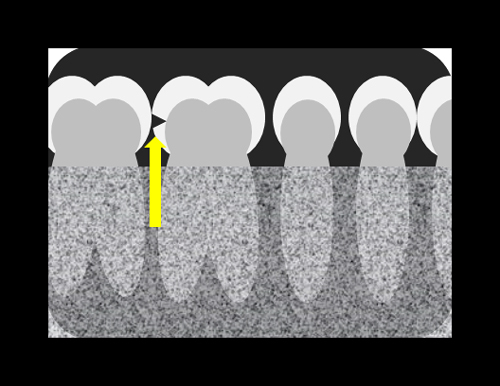 Frequently occurs as a radiolucent triangle in the enamel with the base at the interproximal surface and the point towards the dentino-enamel junction (DEJ). When the lesion extends less than 50% of the width of the enamel it is referred to as an incipient lesion (typically indicating a watch/monitor). Interpretation of caries should be done in a darkened room with no bright excess light for an ideal viewing situation (i.e. not a bright dental operatory). Note the triangular radiolucent area on the distal of the mandibular left second premolar. 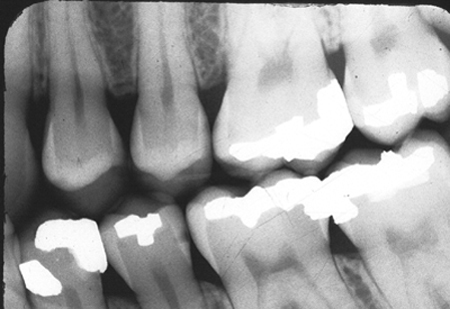 Can you find other areas of caries on this radiograph? If so, please leave your comments below. Distal of #13 appears to be greater than 50% and mesial surfaces of both #14 and #15 look suspicious. There’s also a suspicious radiolucency under the amalgam of #19 so I would look clinically for any open margins or recurrent decay. I can see caries on distal of the maxillary second premolar. how about distal of 2.5 and mesial of 2.6? Yes, on both of those for carious lesions. Distal 25 and mesial 26? Could be a watch but due to broad nature of radiolucent area is why I did not include them.